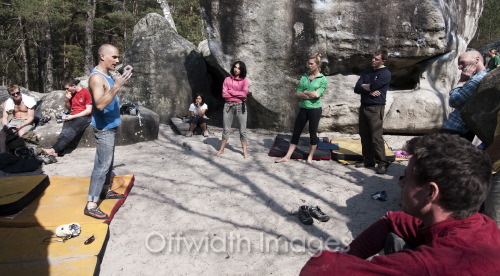 Its 10 years since I was last bouldering in Fontainebleau. It remains a perfect short break getaway, and an excellent opportunity to road test the van. While the April weather back home was uncharacteristically rubbish we had beautiful blue skies and warm sun in the forest. We took a day off bouldering midweek and met up with the clients from the Positive Climbing coaching week hosted by Adrian Berry and Gaz Parry. We met them in the car park of La Roche aux Sabots and spent a great day hanging out with them and photographing some of their experiences. The website has more bouldering photos from the day.